Bruce Springsteen 1973-1986: From Asbury Park, to Born to Run, to Born in the USA is an unprecedented look at a very young Bruce Springsteen and the E Street Band, from their early New Jersey days to their meteoric rise and seminal Born in the USA tour, in photographs almost all not previously published. Photographed by the late David Gahr, foreword by Maureen Orth, edited by Chris Murray. Signed copy: Chris Murray has autographed bookplates especially for Backstreet Records customers, which are affixed to the title page of each book. 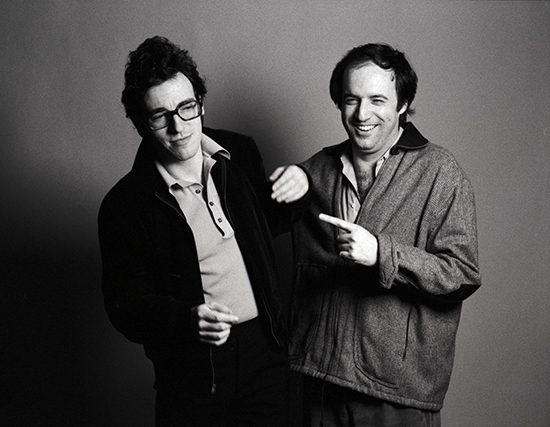 David Gahr (1922 - 2008) was tapped by Columbia Records designer John Berg to shoot cover art for Bruce Springsteen's second album, The Wild, the Innocent & the E Street Shuffle. Gahr's earliest photographs of the musician showcase a youthful Springsteen, not even aged 23, in Asbury Park, New Jersey, on the verge of a career breakthrough. 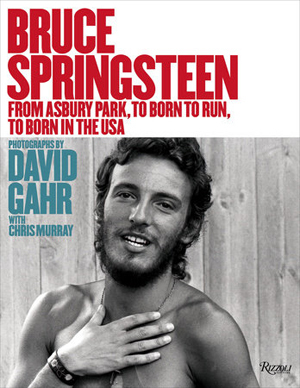 Gahr befriended the rising star, and over a span of more than ten years he photographed Springsteen both on- and offstage on more than 25 occasions. Concert captures include Bruce and the E Street Band performing at the Bottom Line in 1975, a small Crawdaddy! party in 1976, and playing to legions of fans during his Born in the USA tour. 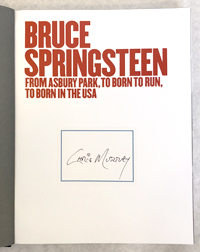 The first collection of Gahr's photography in 50 years, since the publication of The Face of Folk Music in 1968, this is an unprecedented look back at Bruce Springsteen and the E Street Band on their path to becoming rock legends. Photographs are in both color and B&W. David Gahr was one of music's renowned but under-the-radar photographers. Starting in 1958 when Moses Asch of Folkways Records brought his work to a larger audience, Gahr captured iconic images of some of the greatest musicians of the twentieth century, also including Bob Dylan, Pete Seeger, Janis Joplin, Johnny Cash, and Miles Davis, to name only a few. Chris Murray is a writer and founder of Govinda Gallery, which represents some of the best rock music-related fine art photography and photographers in the world. Murray's nineteen books include four collections of Al Wertheimer's Elvis Presley photographs, and Frank Stefanko's Days of Hope and Dreams. Rizzoli, Hardcover, 8.5x11, color and B&W photographs, 192pp.